Passive beaconing solution requiring no energy, used to indicate and mark out traffic islands, lane separators, roundabouts, tunnels. Retro-reflecting omnidirectional (360°) marking. Quick and cheap to install, resistant, durable retro-reflection properties. Studs compliant with standard EN-1463-1 / EN-1463-2. 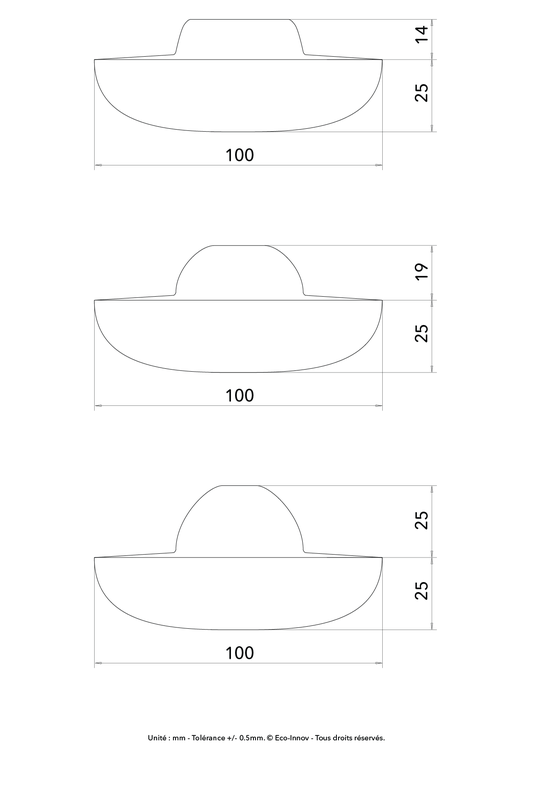 Three dome heights available: 14 mm, 19 mm and 25 mm. Embedded, hardened glass reflecting edge stud. Quick and cheap to install. Glass is insensitive to static electricity (no risk of dust accumulating, which is not the case with plastic reflecting studs). Glass is cleaned easily by rain, so no manual cleaning is required. Excellent stability of retro-reflecting properties over time. More durable than reflecting road studs made of aluminium or plastic. Non-skid treatment on 14 mm and 19 mm domes. Our reflecting road studs with dome heights of 14 mm and 19 mm are compliant with standard EN-1463-1 / EN-1463-2. Remark: it is advisable to install these reflecting studs in areas that pose no danger for users (cyclists, pedestrians, etc.). 1 – After deciding where the studs are to be installed, drill a hole with a minimum diameter of 106 mm and 45 mm deep. 2 – Clean and dry the hole. 3 – Fill the hole 2/3 full with 2-component epoxy adhesive or elastomeric bitumen. Do not use cement or any alkaline material that may affect the reflecting film on the base of the stud. 4 – Insert the stud into the hole. Use a mallet to level it flush with the ground. Immediately remove any residual adhesive from the stud. Leave a weight on the stud until the adhesive has set (see the manufacturer’s instructions for the necessary time). Remark: throughout these operations, make sure to protect the reflecting stud and keep it clean. Failure to comply with these instructions may lead to the guarantee being suspended.